Crookwood make 3 types of VU meters, each with a stepped attenuator so you can get the VU to work properly with modern digital level signals. VU meters are great! Everybody knows what they look like, and they still have a great place in audio production for giving you a feel for the dynamics and levels of real music. Sadly real VU meters are difficult to come by. There’s a standard (BS6840:part 17 1991 & IEC268-17:1990) which they need to comply with, otherwise they’re just useless black needles bouncing up and down on a beige background. 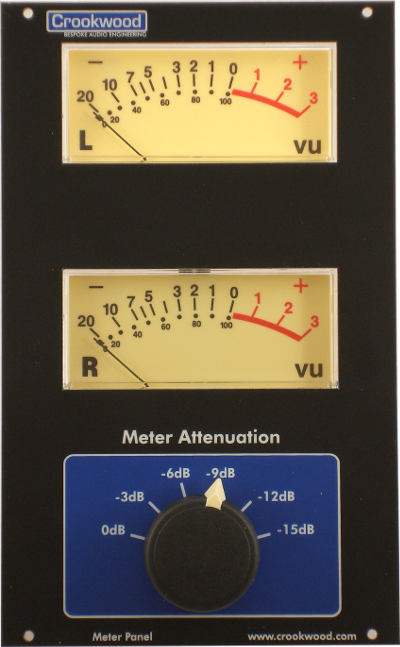 We reckon that there are only 3 or 4 manufacturers of real VU meters in the whole world! Crookwood use real VU meters that meet this standard and in addition, they’ve got a great precision attenuator, so no matter how hot the signal is coming out of your DAW or DAC, you can get the meters to work properly. We make 3 Vus to satisfy most folk. A large 2U 19″ stereo VU meter with attenuator. A Crookwood control panel sized stereo meter with attenuator for mounting with our consoles & controllers. Accurate Metering is essential for making good music. Peak meters are great for detecting maximum levels, but averaging meters, like VU’s are great for judging the relative loudness of a signal, and making judgments on the compatibility of what you’re listening to. By connecting these mechanical analogue VU’s across your calibrated master monitor DA, you’ll get a good feel for the loudness of the signal compared to other material. There are however 2 problems: Meter overload and Absolute Reference. VU’s were designed for handling signals around +10dBu peak. However most DA’s are calibrated to 0dBfs being about +18 or +22dBu. If you connect a normal VU across this, the needle will slam to full scale, and the meter becomes useless. To overcome this, we’ve added a switchable attenuator, so no matter what your 0dBFs level, you can make the meter work properly, without overloading. The levels shown are absolute to within 0.1dB, and they keep the VU terminated properly, no matter what attenuation is. Unfortunately the term VU is rather abused. The VU spec is actually very well defined, and although nearly all VU’s will show the same level with a constant test signal, when you get a real musical signal, different VU’s will show different levels. The answer is to use a real VU meter rather than a $5 clone with VU written on it. 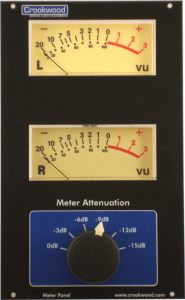 The VU meters we use are very well specified, and consequently very expensive. They do however tell the truth, which is why you want the meter in the first place. Isn’t it?